This was first heard as the award for ‘Excellence in Financial Reporting’ was announced for the financial year 2008-09. It was a moment of realisation for the organisation and the benchmark was set. Came the end of financial reporting for the year 2009-10 and Akshaya Patra was once again the recipient of the ICAI Gold Shield Award. It was a thrilling moment with higher expectations for the next year. But, no stones were left unturned to grab the award for the third time for the year of 2010-11. And as the award was announced, it was a hat trick for Akshaya Patra. This led the organisation to set its eye on ICAI Hall of Fame. The journey was challenging but the level of sincerity was doubled. With the announcement that Akshaya Patra bagged 2011-12 Gold Shield Award for the fourth year in a row, the organisation was one step away from the Hall of Fame. Hall of Fame is no simple walk through and the organisation was well aware of it. With the reporting that wrapped the Financial Year 2012-13 all eyes were on Akshaya Patra. Eager ears and racing hearts with controlled anxiety gathered together for the ICAI Award ceremony on the 6th of February 2014. A trail of awards continued till the moment when the voice uttered “… the ICAI Gold Award in the not-for-profit category goes to The Akshaya Patra Foundation… and with this Akshaya Patra enters the ICAI Hall of Fame… it is the first time ever in the NGO category and the organisation is the third to enter the Hall of Fame across all categories…”. A humbled moment for the organisation, when all the efforts, sincerity and commitment that went through was recognised. 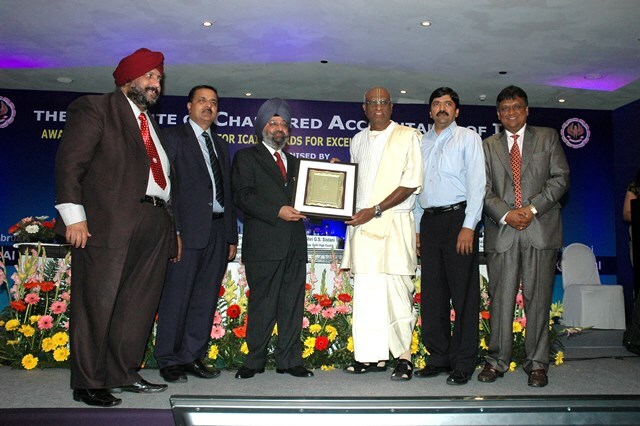 The Gold Shield Award of the Institute of Chartered Accountants of India is the highest award given by ICAI for Excellence in Financial Reporting. The review is done and the awardees are decided on absolute accuracy and not relative merit. The selection process is so strict that no award is given in certain categories if none meet the criterion. Akshaya Patra is the third organisation to be enlisted in the ICAI Hall of Fame ever since the inception of the award in 1958. The other two organisations are Infosys Limited and Nucleus Software. Furthermore, Akshaya Patra is the first organisation in the not-for-profit sector to have received this honour.